This information relevant to the PAL Intellivision version 1. Most of the custom ICs have heatsinks glueed on top, making them difficult to identify. 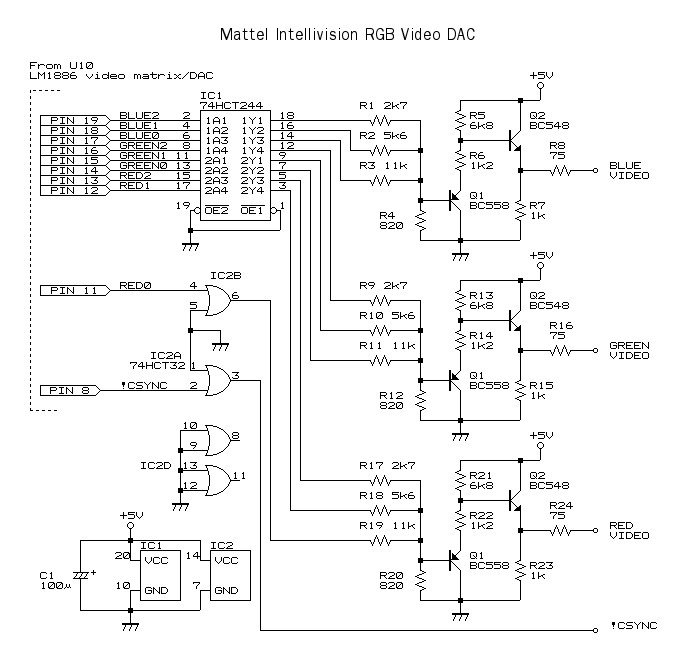 Composite video is generated by a LM1889/LM1886 pair, datasheets are available on Datasheetarchive.com.. LM1886 take 3 bit digital RGB data from the one of the big custom ICs and generates R-Y, B-Y and Y. These colour difference signals go to the LM1886 which combines them into chroma. The signal is then combined with the Y signal (luma), buffered by a transistor amplifier and send to the RF modulator. 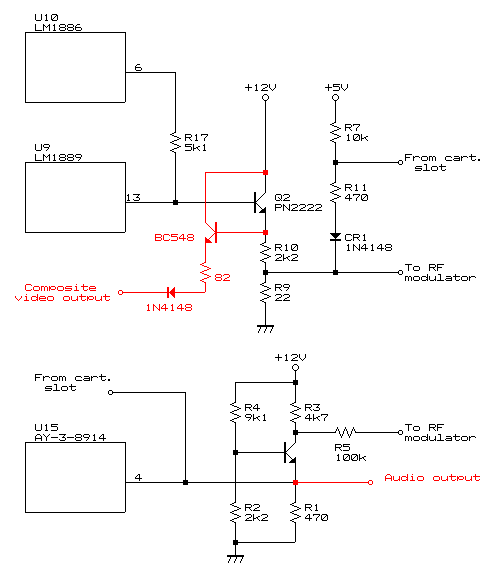 Here is a circuit diagram of the final parts of the video circuit. Red components are additional parts required to make the output suitable for a video monitor. The modification is very easy, only requiring three, easily obtainable parts. There is a significant ammount of dot crawl in the video output (it's present in the RF video too). Unfortunatly this isn't easy to reduce without some complex active filter circuitry. Audio output is an educated guess as my intellivison console has a sound fault. I did mention that the LM1886 accepts a digital RGB signal from the custom video IC, didn't I? So let's bypass this LM188x crud and build an RGB DAC! IC1 and IC2 are used as non-inverting buffers, they can be substituted with any non-inverting logic gates (3x 74HCT08 would work) but they MUST be of the 74HCT type, not 74HC or 74LS. 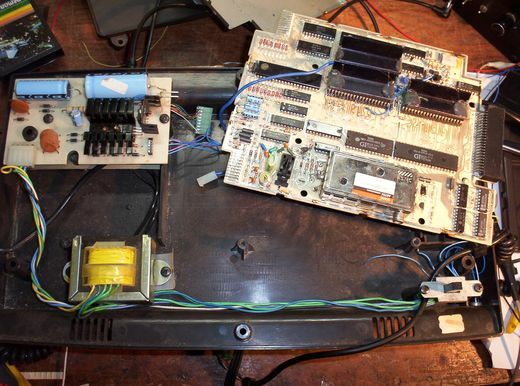 The outputs are suitable for an RGB SCART socket found on a TV but the composite video modification mentioned above should be used in place of !CSYNC.